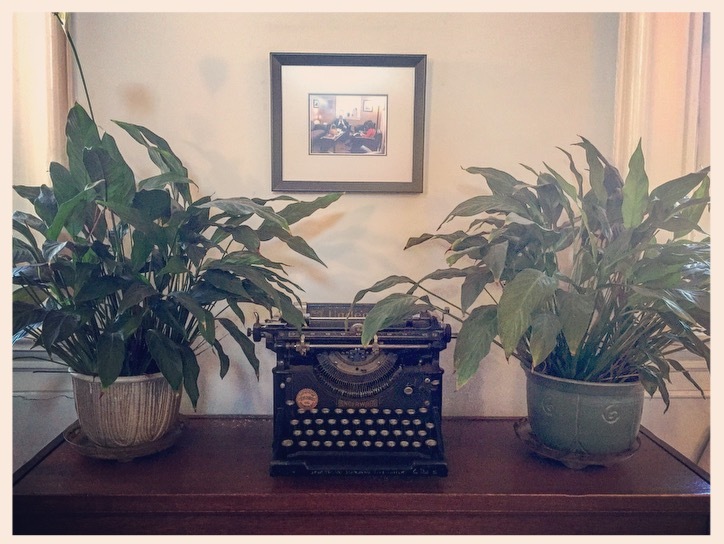 When I moved into my new office, here in historic Manly Hall (once belonging to the late-Leon Weinberger), just a few doors down from the office William occupied for many years, he gave me some plants to spruce up the place. That was the good ol’ days, the time of the ancestors, before even Betty arrived. So William was here 20 years before me, coming to Alabama when I was entering just my second year of undergrad elsewhere. 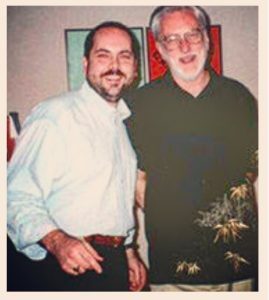 The first time I met him in person was in November 2000 in Nashville, TN, at an American Academy of Religion conference, when I was interviewing for the position that I currently hold. 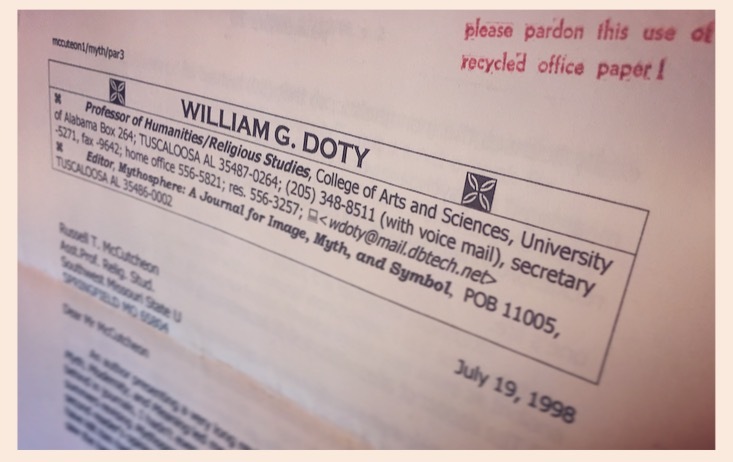 At the time I knew some old timers in the field who, when I told them about my interview, told me that they also knew Bill Doty (from either his early days as a New Testament scholar or his more recent and widely read work on myth). Their search for a new Chair, the previous year, had failed and, with Patrick Green now retired, William became Chair for the year (a position he had also held from 1983-88) and the job search started all over again. And I got an interview. So, armed with the limited knowledge I’d gained from talking to a few others as part of my prep for the interview, I stood to greet him as he walked into the interview hall’s waiting area, calling out my name. So that was my introduction to the fellow his friends affectionately knew as a trickster. Reading that letter now, almost 20 years later, I see that it’s classic William; there’s the recycled paper (consecutive pages from a marked-up manuscript of his on myth in James Hillman‘s work is on the inverted, reverse side of the three page letter) and then there’s the (probably custom-made) stamp at the top, as well as the long and detailed list of comments on my essay as well as his generous offer to send some of his work. And there was even his invitation for me to review some books for him — which introduced me to his sometimes cryptic shorthands that needed to be deciphered like a code: for e.g., this was how I learned that “(M)” signified Mythosphere, a journal he edited back then. Years later, when emailing with him became routine, I quickly came to realize that his emails’ were no less coded: his subject lines usually contained the first few words of the email itself, such that it all had to be read together — otherwise, the body of the email started in an oddly abrupt fashion and you might not be sure what it was all about. I wouldn’t want to overstate our relationship, but I did have the good fortune to dine at his home a few times, with him and Joan (they were married in 1965), and go to some lunches at a Chinese restaurant near campus. 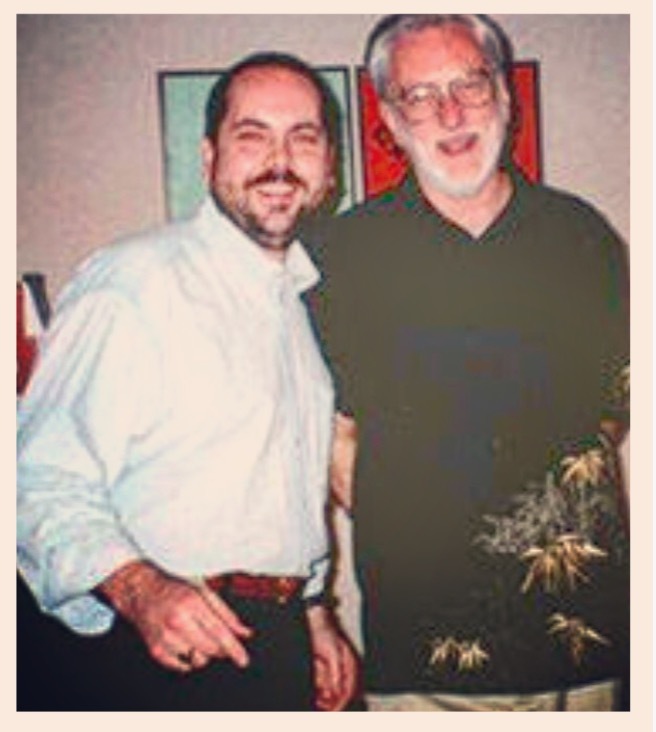 Given that he retired less than two months after I started it’s fair to say that I didn’t work long with William, In fact, among my first tasks as Chair was to organize a reception for him, which we held in the Garland Hall art museum on October 4, 2001 — yes, that’s us. A little younger. but next Mon, the following Mon/Weds (well, maybe not even that last one), and I’m outa here, teaching-wise. Just cannot stand the constant pressure to document this that, etc., the requirements to have courses/book orders in MONTHS before offering courses, etc. And of course just the aging process…. I didn’t see William often after that, but, if you looked in the right places and decoded things properly, his influence, even on me, was still evident. 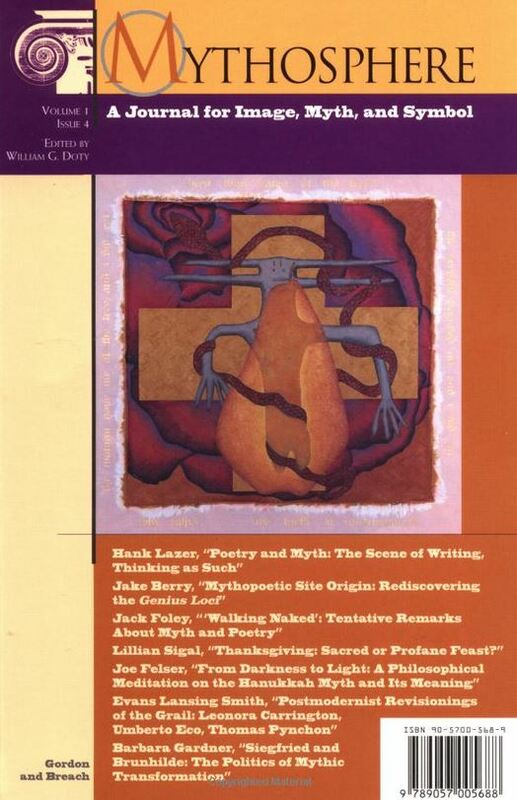 For instance, I’d used his Mythography book back in 1993, when, in the first year of my career, I was asked to teach a course on myth and rituals at the University of Tennessee — a topic I wasn’t prepared to teach whatsoever. So, after saying yes, I quickly amassed a pile of books to help me and his was one of them. Oh, and that essay of mine — the one that he read and which prompted him to write me a letter — resulted from teaching that course multiple times between 1993-6; and, for the past sixteen years, a course the Department eventually renumbered and retitled as REL 341 Theories of Myth, became one that I regularly taught. Kind’a curious how things circle back around. And then there are those lilies. They’re immediately behind me, as I type this at my office computer, replanted by me into four pots — the pottery was made by a colleague too, by the way. They’ve been in this office for 16 years and I still recall the day he arrived with them. I water them dutifully each week, and watch them reach for the light of my windows and, occasionally, bloom. Until the memorial I admit that I hadn’t thought much about those plants, much as I’d forgotten about that 1998 letter tucked away in my filing cabinet. But, yes, I’m thinking about them now and thinking about his kind gesture to a newcomer taking the baton. #2 The danger of allegorizing and “interpretation”: One must be on guard against treating myths as allegories, substituting and reducing by means of their terms metaphoric creativity to some ideal/lesson (which simplistic Jungians do all the time). It is proper only to discuss where myths are situated in the psyche, not whence they come, which is the province of theology or metaphysics. Nor do we have positive knowledge about the afterlife. Hence the attentive reader comes to recognize the limits within which psychology of whatever sort is stretched. Although we didn’t share the same focus on psychology, this attentive reader always appreciated scholars in a the preceding generation who fought hard to define the study of religion as something other than theology. We’re their beneficiaries, all of us in the field — teachers and students alike. But with our specific situation here in Alabama in mind, it’s earlier faculty, like William, whose labors and reputations helped to ready the ground for us. 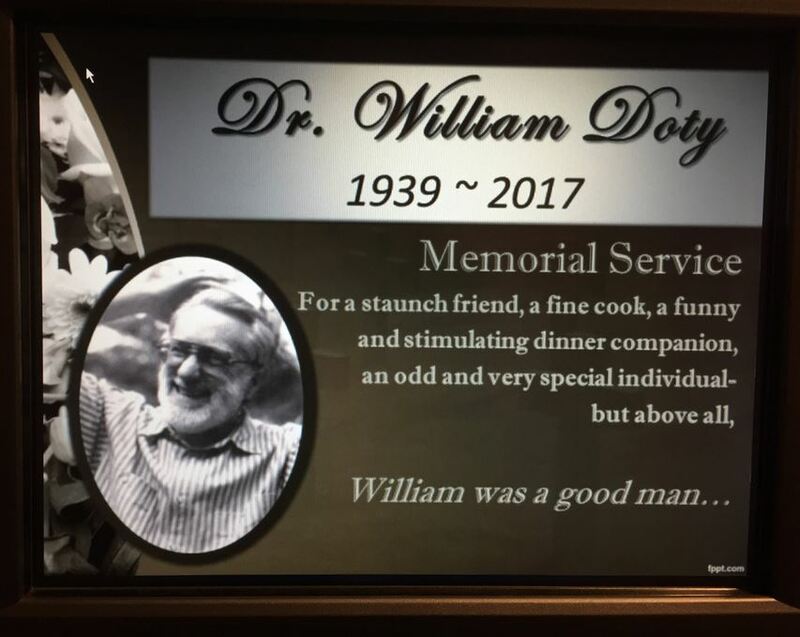 This entry was posted in Faculty Blog, Relevance of Humanities, Religion in Culture and tagged 50 Years, 50th, Anniversary, Memorial, Myth, Ritual, William Doty by Russell McCutcheon. Bookmark the permalink.